Originally constructed in 1974, the Tarbela Dam is the world s largest earth- and rock-filled structure, standing almost 500 feet high and straddling the Indus River for 9,000 feet. 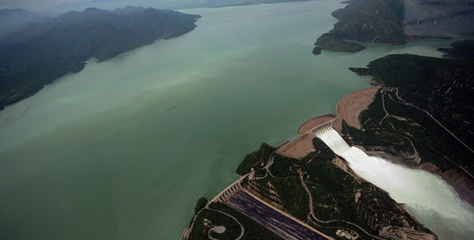 Its existing hydropower facilities supply about 16% of the electricity generated in Pakistan. The primary purpose of the Tarbela Dam Project was to regulate the flows of the Indus River for irrigation use. This project is in fact part of a wider set of infrastructure projects, the so-called Indus Basin Irrigation System (IBIS), which is the world s largest irrigation system. Other objectives were to achieve substantial generation of hydroelectric power and flood control by conserving snow melt and monsoon flows of the Indus River. Currently, there are several expansion plans in store for the Tarbela plant. The World Bank is financing the Tarbela Fourth Extension Project (1) to increase the dam s ability to produce electricity by more than a third. The financial institution argues in fact that the country s need for energy is increasing and that widespread blackouts might lead to major outcries in the country. USAID and US government are also using the same argument for co-financing the Tarbela project and other similar ones (2) Moreover, the Government of Pakistan is planning to build five more river development projects by 2016 that would further deteriorate the ecosystem of the Indus basin and displace families: Diamer-Bhasha, Kalabagh, Munda, Akhori and Kurram Tangi dams (3). Affected communities in the Indus delta have been actively protesting the devastating impacts of the existing water development projects; the Tarbela dam caused itself the displacement of at least 100,000 people; many of them have not been properly compensated nor resettled. Pakistan Network for Rivers, Dams and People (PNRDP) has been struggling for many years against the governments hydropower plans. It criticizes the government s outdated policies, grossly mismanaged, bureaucratic and corrupted institutions and the country s obsolete energy plan. Project Details Power generation capacity is 3,478 MW through 14 power generating units. Catchment area of the reservoir created by the dam is 169,600 square kilometres. The reservoir, with a maximum depth of more than 450ft, can impound up to 11.62 million acre foot (MAF) of water at the maximum lake elevation of 1,550ft. Net usable capacity of the reservoir is 9.68MAF. The water is stocked during the months of June, July and August, when the river flow is at its maximum. Asian Infrastructure Investment Bank (AIIB) - The Project, to be co-financed with the World Bank (WB), comprises the installation of a power house at the fifth tunnel (Tunnel 5) of the Tarbela Dam, and construction of a transmission line to connect the power to the national grid. The WB’s co-financing will be in the form of an Additional Financing (AF) for the existing WB-financed Tarbela Fourth Extension Hydropower Project (T4HP). The Tarbela Dam was originally constructed in the 1970s. Development of Alternatives Opponents to the project jointly criticizes the government's outdated policies, stating the need to replace the Land Acquisition Act of 1894 with a more comprehensive relocation policy. They also stated that the government departments in charge of rehabilitating affected peoples are grossly mismanaged, bureaucratic and corrupt and in need of reorganization. -national participation in the policy-making and implementation process. Why? Explain briefly. Many families have not yet received due rehabilitation and compensation measures, even after so many years. The project does not benefit local communities and is part of a top-down energy generation plan with poor consideration of small communities claims. Other Comments (*) The project was fully completed in 1984, at a cost of $1.49 bn. The funds coming now for the extension plans are currently under estimation.